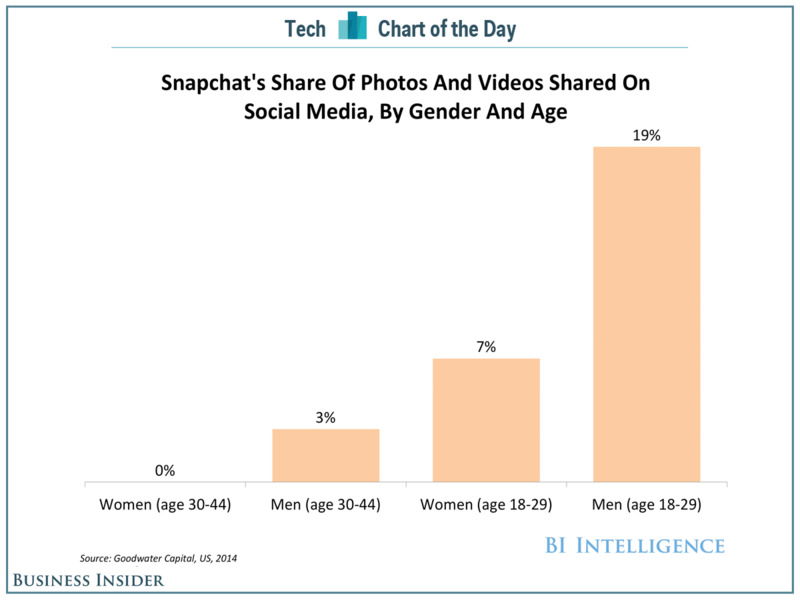 Although Facebook and texting are still popular for sharing most photos and videos, Snapchat has a pretty impressive hold over millennials — especially males in that age group. Goodwater Capital, a VC firm that invests in early stage consumer tech companies, recently released a study based on a survey of 200 mobile users in the US in hopes of better understanding how people share content across various social media. 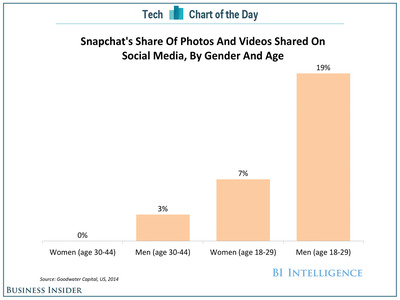 Based on Goodwater’s data, charted for us by BI Intelligence, nearly one of every five men aged 18-29 share their photos and videos through Snapchat — more than Facebook (17%) and way more than Instagram (only 4%). Millennial women still tend to share more through Facebook and Instagram than through Snapchat (24% and 8%, versus 7%). And hardly anybody over 30 said they used Snapchat to share content — Facebook was a far more popular option for them.